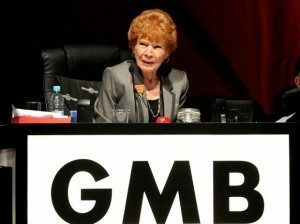 GMB Union sadly announce today that President Mary Turner has passed away after a short illness. Mary has been a trade union activist for over 60 years, and was a much loved and hugely respected member of the GMB Union. was was a trade unionist from the day she started work. When she was 16, her father asked her ‘have you joined a union yet? – that was the beginning of a trade union career that has spanned over six decades. First joining the Tailor and Garment Workers Union (aptly a union that would go on to join GMB), Mary worked at Jackson’s Tailors on Oxford Street, then went on to serve as Mother of Chapel in the print industry before taking time off to raise her children. For 59 years, Mary was married to Denny, whom she had married within six weeks of meeting. They shared a wonderful life together, filled with love, humour and happiness. Denny sadly passed away in 2015. As a trade unionist, Mary was a trailblazer who never took no for an answer. When she returned to work part –time in 1970, she started work as a dinner lady in Brent and quickly set about organising the female workers who were poorly paid, untrained and treated badly. It was also during this time that Mary developed a lifelong passion that she would campaign on for decades to come: free school meals. Having seen hungry kids and the stigma of those who had to queue separately for free school meals, Mary could not let that stand and she was instrumental in ensuring free school meals for kids became Labour party policy. From feeding 600 young marchers during the people’s March for Jobs in the 1980s, to fighting the National Front and leading, recruiting and supporting thousands of low paid workers, Mary has led our movement. In recognition of her incredible work, Mary was elected to GMB’s executive where upon her election, she served as the only woman out of 40 members. In 1997 Mary was elected as President of GMB a position she has been re-elected into every year since. She has served on the Labour Party National Executive Committee, chairing the Party in 2004. In 2010, Mary was awarded an MBE, which was followed by a CBE in 2017. “I and the whole of the GMB are truly heartbroken by the loss of our President Mary Turner, a woman who has been the heart and soul of our union for a generation. “The word giant is sometimes overused but in the case of Mary she really was a true giant of our movement. Mention the name Mary Turner and people will smile and say she had that unique blend of fighting spirit mixed with care and compassion. “She has left this world having made a real difference to people’s lives, that’s something we are all proud of and that GMB will never forget. Be it fighting for dinner ladies in Brent, for hungry kids to have a free school lunch, for pensions, for young people, against discrimination and the National Front, Mary has led our movement. They broke the mould when they made Mary Turner, she will be deeply missed by her GMB family, including her beloved London Region. “Mary may be gone, but she has left behind a union that will ensure the values and principles she fought her whole life for, will always endure.